Three youngsters—a deranged child, a Jewish survivor, and a singer of laments—endure the terrors of World War II Greece and the equally savage civil war that follows. Revisiting the Greek culture and history explored in his first novel, Brown (Blood Dance, 1993) devotes his second to the brutal events, both imposed and self-inflicted, in that country during the mid-20th century. The story is narrated into a tape recorder left in the possession of an old woman, Aliki, by a Greek-American scholar researching “rural lament practices.” But Aliki, the last professional lamenter—a singer of dirges following someone's death—in her northeastern Greek village, uses most of the tape to relate the dark events of her teenage years. After the occupying Nazi forces shot her father in 1943, she was taken in by a kindly neighbor, Chrysoula. 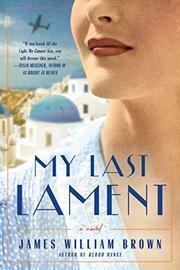 But Chrysoula is hiding two Jewish refugees in her cellar, teenage Stelios and his mother, Sophia. When the Germans discover them—perhaps tipped off by Takis, Chrysoula’s son—a melee ensues during which both Sophia and Chrysoula are killed. Now Stelios, Aliki, and Takis leave for Athens, beginning a long, episodic journey of love and survival, funded by the shadow-puppet performances they give. Takis, a jealous child of 11, appears unhinged, perhaps schizophrenic, or maybe he’s a violent sprite, emblematic of the madness that has descended on the divided nation; Aliki has a seer’s gifts in her lamenting skills; while Stelios’ role is both puppeteer and conduit to history and literature (notably The Iliad). Events come thick and fast—guerilla attacks, abduction, imprisonment, death—but the restless plot, shifting locations, and heaping up of suffering become overwhelming, fragmenting the overall impact. A respectful but hectic tale of national collapse and grief that falls short of epic emotional resonance.